Land use is a collective term that encompasses the ownership, the activity and the biophysical surface cover of the land. Land use classifications generally describe all aspects of activity continuously across a landscape, such as; agricultural uses, environmental uses and residential/industrial uses. Detailing land use arrangements across the landscape makes it possible to analyse past, present and propose future interactions of humans in the environment. However, the accuracy, scale and classification systems used in land use information can limit the utility of the information. The former Department of Environment and Primary Industries developed a method to creating land use information that can be repeated annually using a consistent spatial unit and classification system, called the Victorian Land Use Information System (VLUIS). The VLUIS includes all aspect of the collective term ‘land use’ by describing the ownership (e.g. 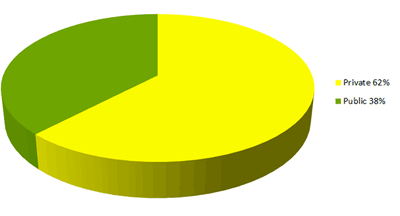 public or privately owned) the property type (e.g. warehouse or dairy farm) and the cover type (e.g. cereal crop or water). The maps and charts presented in Figures 1 -3 are a result of the data creation in the VLUIS project and reflect the status of Victorian land use in 2012/13. The data can be accessed freely through the data.vic spatial data repository. For more detailed information about the VLUIS project and its objectives and for more information on the data please contact the custodian using the online VRO Feedback form. Land tenure is the form of an interest in land. Some forms of tenure (such as pastoral leases or nature conservation reserves) relate directly to land use and land management practice. More than half of Victoria is freehold agricultural land (55%), while around 38% of the state is public land, consisting of National and State Parks, Forests and Declared Water Supply Catchments as shown in map 1. 1 The three definitions for land tenure, land use and land cover are from: Guidelines for land use mapping in Australia: principles, procedures and definitions, Edition 3, Commonwealth of Australia, 2006. Land use means the purpose to which the land cover is committed. Some land uses, such as agriculture, have a characteristic land cover pattern. These usually appear in land cover classifications. Other land uses, such as nature conservation, are not readily discriminated by a characteristic land cover pattern. For example, where the land cover is woodland, land use may be timber production or nature conservation. Land Use in Victoria (from VLUIS data) is classified by the Australian Valuation Property Classification Code (AVPCC). 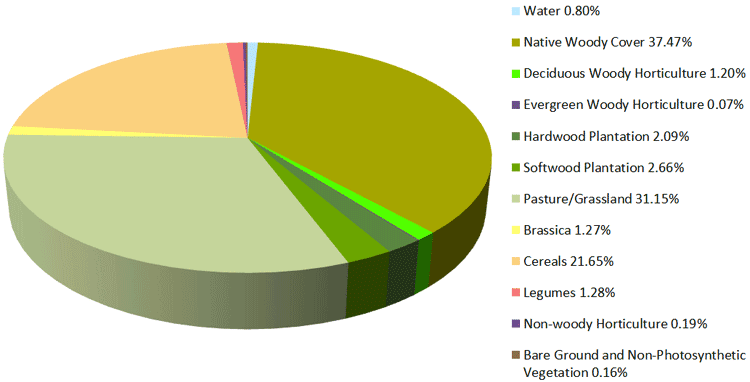 There are nine primary categories of land use in the new VLUIS data. The conservation area across the state is 33.52% as it primarily relates to the publicly owned land. The remaining proportion is split between; residential (4.56%), commercial (0.11%), industrial (0.20%), extractive industry (0.14%), infrastructure (0.82%), community services (0.33%), sport recreation and culture (0.18%) and primary production (55.47%) (map 2). Primary production is land which has the principle use of agriculture, forestry, aquaculture or animal production. Land cover refers to the physical surface of the earth, including various combinations of vegetation types, soils, exposed rocks and water bodies as well as anthropogenic elements, such as agriculture and built environments. Land cover classes can usually be discriminated by characteristic patterns using remote sensing . Land cover is classified into groups that can be identified using broad scale satellite imagery (Map 3). The woody vegetation class includes large trees such as native forests, remnant vegetation, hardwood and softwood plantations and amounts to 42.22% of the state, the largest proportion. The pasture/grassland class describes any herbaceous ground cover that is present for most of the year and totals 31.15% of the state. Cereal crops, such as wheat, barley, and oats are the dominant crop grown in Victoria. 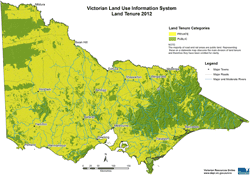 The Victorian Land Use Information System (VLUIS) is a system that collates land information together for the state of Victoria. VLUIS maps the land tenure (e.g. private land), land use (e.g. cropping industry) and land cover (e.g. crop type) for each parcel of land. Please follow the link for more detailed information about the VLUIS project, its objectives and outcomes. In 1994 an Australian Land Use Mapping (ALUM) standard was developed for the Murray Darling Basin Commission (MDBC) (Baxter and Russell 1994). In 1996 a collaborative national land use mapping initiative called the Australian Collaborative Land Use Mapping Program (ACLUMP) was established. This initiative further refined the ALUM classification (Bureau of Rural Sciences 2006) and this was used when the former DPI in Victoria began a state wide mapping program in Gippsland in 1996 that was finished in the lower Goulburn in 2005. In 1944 the State and Regional Boundaries Committee produced an Atlas of maps covering Victoria's Land Use, Population, and Natural Resources. Here are presented a number of the maps showing Land Use across Victoria in 1944. This report describes the evolution and capability of a land use impact model (LUIM) used in the Department of Primary Industries, Victoria. The Historical Geography and Landscape Change section describes the Historical Geography and Landscape Change in the Costerfield District. Soil and landscape data, land use maps, the climatic record, and regional experience of agronomists and land managers have been used to define Victoria’s major ‘Primary Production Landscapes’ (PPLs). These PPLs have been characterised for dominant soil types and associated inherent management issues as well as major agricultural industries and practices that occur within them. Statewide maps for key climatic variables including temperature, rainfall and growing season rainfall have been used to provide context for predicted changes in climate across the PPLs. Soil and land are limited resources. They support a range of economic activities under different land uses. Appropriate land use and good management are essential to ensure that these resources are available for future generations. The satellite image shows Victoria's land use in 1993, using Landsat 5. Mapping, symbology and metadata can be access from the VLUIS project page. The Victorian Heritage Register On-line website (external link) provides a comprehensive listing of Victoria's most significant places, objects and historic shipwrecks. The Heritage Inventory lists all known historic archaeological sites and relics. The Planning Schemes Online website (external link) provides access to the approved planning schemes for the 78 Local Government and for the 3 special planning areas in the State of Victoria. It enables viewing of land use provisions and zoning maps. Land Use and Management Information for Australia (external link) is an an informative site from the Bureau of Rural Sciences in collaboration with State agency partners and their organisations, about available land use data and information in Australia. The Valuations Best Practice Specifications Guidelines (external link) is a document developed to assist councils prepare for biennial revaluations. Appendix B includes all codes and descriptions in the Australian Valuation Property Classification Code (AVPCC), which is the code used to describe land use in the VLUIS product. MODIS satellite imagery can be obtained from “Reverb - ECHO” (external link). 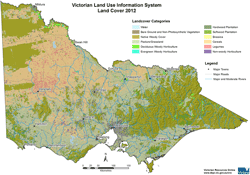 The Victorian Land Use Information System uses the MOD13Q1 dataset from the MODIS Platform (external link) for the land cover data creation.